Welcome to Flashback Friday where you can revitalize past entries. This week’s entry is one of my favorite dishes of all time. 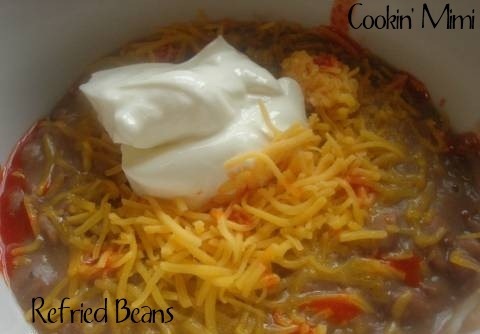 I adore refried beans because they have so many uses. They are cheap frugal and easy with very little hands on cooking. Use your permalink which is the link in your browser’s address bar. Link back to Cookin’ for My Captain, Cookin’ Mimi or both if you’d like. Please only 1 or 2 entries. Visit and comment on the other entries. Spread some comment love. By entering your link on one blog it will show up on both. I’ll be stumbling posts and tweeting them using the hashtag #FlashbackFri and you never know your post might be highlighted on next week’s entry. Hi! Hopping over from SITS — I’m in your small group and am finally getting to stop by everyone’s blogs! Flashback Friday looks like fun — I’m going to see if I can figure out how to make it work (no, it doesn’t sound difficult, but one never knows). Meanwhile, it’s nice to “meet” you!!! Stop in over at my place sometime, if you’d like!